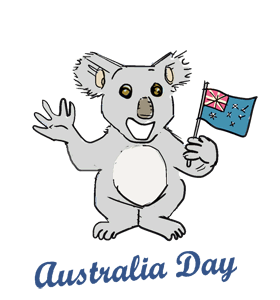 Australia Day commemorates the arrival of the First Fleet of 11 convict ships from Britain. On this day in 1788, Captain Arthur Phillip first raised the British flag at Sydney Cove, marking the British occupation of Australia which has been claimed 8 years earlier by the arrival of Captain James Cook in 1770. Australia Day is observed annually on January 26th each year with barbeques and fireworks. Today, the day gives Australians the opportunity to reflect upon what it means to be Australian, the history that shaped the nation and the brighter future that the country has to look forward to. In 2015 Australia day coincided with 150th anniversary of Colac's Botanic Gardens. The First Fleet, consisting of 11 ships and led by Captain Arthur Philip from Great Britain, arrived at Port Jackson on January 26, 1788. Australia was originally designed as a penal colony - a place used to exile convicts and criminals. The first was named the Colony of New South Wales. The Australian Flag is flown to commemorate this holiday. The flag includes: the Union Jack, representing historical ties to Great Britain; a large white seven-tipped star representing the 7 provinces making up the Commonwealth of Australia; and five white stars in the Southern Cross constellation pattern, a reminder of their Southern Hemisphere location. The entire population of Australia (22.3 Million) is less than the population of Texas (26 Million). Watch fireworks displays. Some of the grander displays are at Sydney harbor, Rooty Hill and the shores of Lake Burley Griffin. Watch or attend the Oz Day 10km race in Sydney, Australia. Visit Hyde Park in Sidney where many Australia day events take place. Attend flag raising and citizenship ceremonies in Canberra and Perth.